With biopellets being a very popular method of fueling bacteria growth, aquarium keepers are chomping at the bit to get their hands on some quality pellets and media reactors, and manufacturers are cranking them out as fast as they can. Unfortunately, the nano tank crowd often gets overlooked, which is commonplace for aquarium equpiment because that niche market, like the aquariums themselves, is much smaller. CAD Lights, however, fancies the nano aquarium and has just revealed their latest creation for small tank lovers, the NR-1 biopllet reactor. This tiny biopellet tumbling reactor has a footprint of just 2.5″ in diameter and a 12″ height, but can pack in up to 150ml of pellets making it suitable for tanks from 5-50 gallons. 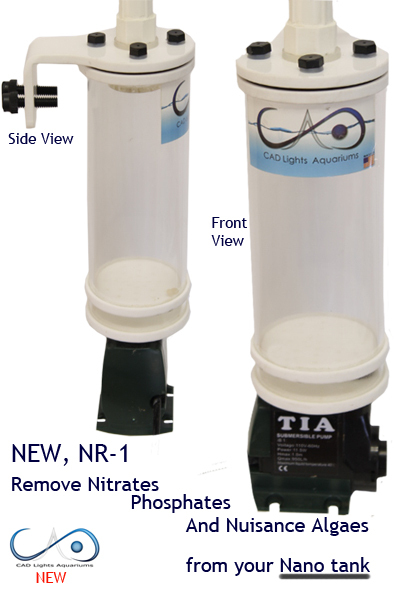 The NR-1 was specifically designed to be incorporated into a number of the CAD Lights aquariums, including their new 4G, 8G, 18G Mini series systems. To get the pellets moving, the NR-1 utilizes a Slim TIA Professional pump, which moves 200 gph at 11.5 watts of juice. 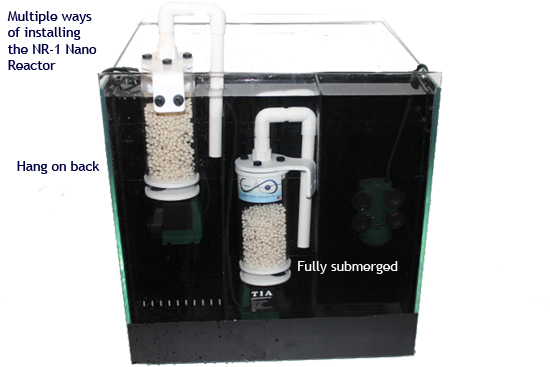 The reactor’s body is made from 100% cell-cast acrylic, which is the best acrylic for aquarium use, and the entire assembly will have a retail price of $89.99. In terms of mounting options, CAD Lights designed their latest nano gear to either sit in the rear filtration chamber or hang on the inside of the chamber. Obviously the ideal situation is to have the reactor hidden completely by submerging it, but for those tanks with slightly less real estate, the hang-on option will work nicely though it may intrude into your viewing space.